Twice a day for months, Cicelia Bracken and her children tracked the progress of their home-under-construction, watching as beams were erected to sketch the outlines of an imagined life with a working kitchen. At 31, Bracken hadn’t had a place where she could shut the door and sit with her thoughts for years. Nor had her four young children, all of them under 6, who peered into the windows, jostling for first pick of the new bedrooms. For most of their lives they had shuttled between foster homes, relatives’ houses and shelters — upheavals so frequent that the mere sight of a policeman in an approaching car made Bracken’s 5-year-old daughter freeze with panic. “No, sweetie, they’re not coming for us now,” Bracken would tell the apple-cheeked girl. Since 2008, when she first began using heroin, then methamphetamine, Bracken had seen all but one of her children taken. By 2016, when her fourth baby was removed, Bracken could spot social workers from Child Protective Services 50 feet away. But now she was part of an unusual experiment — a live-in drug treatment program that focused on rebuilding families, and some of those same social workers had become her biggest cheerleaders. They promised to be there when Bracken graduated from the program, called Rising Strong, in a year’s time. She’d have her education, sobriety and mothering skills back on track by then, they said. Bracken, addicted for the better part of a decade, wasn’t nearly as optimistic. An alumna of the child-welfare system herself, she’d dropped out of high school in the 11th grade. Sometimes she worked a couple of months at Walmart, or as a health care aide. Other times, she panhandled. Burning with shame at a life of failure, Bracken had no idea what a familiar pattern her life represented. 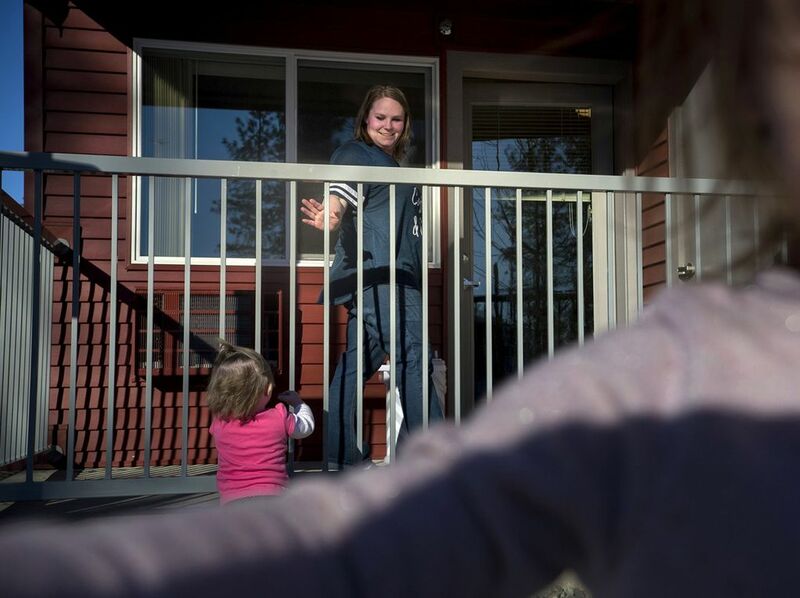 Not long before Bracken hit bottom and lost her third daughter to the state, staffers at Spokane’s Empire Health Foundation had been trying to figure out how best to tackle two of the region’s stubbornest problems — obesity and addiction. Foundation President Antony Chiang was not excited by the idea of funding yet another detox program. What he wanted was something revolutionary that might head off those problems before they ever began. This article is part of a series looking at the fallout of the opioid epidemic on K-12 schools and the foster-care system, as well as promising solutions to help stem the crisis. It is made possible in part by support from the Annie E. Casey Foundation and Education Lab funders. 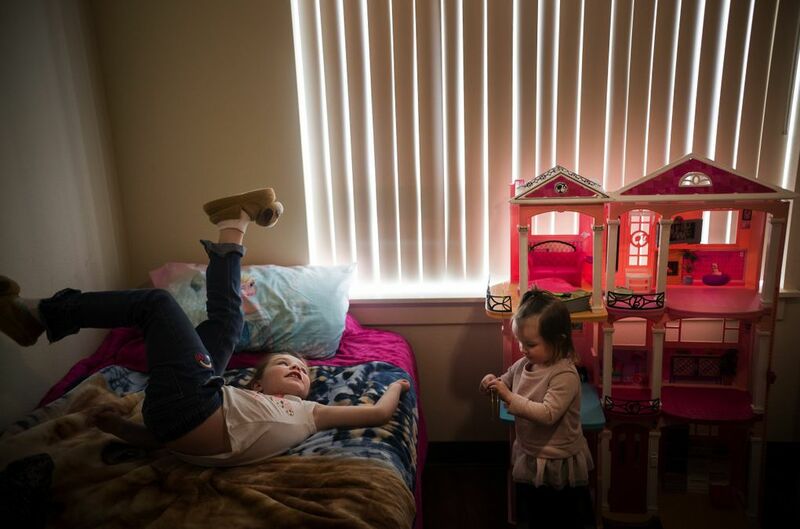 The nation’s opioid crisis is taking its toll on children across the Puget Sound region. Here’s how schools could offer hope. Research linking obesity, addiction and other adult health problems to childhood suffering provided Chiang with his answer: Hospitals and treatment centers were filled with people who had undergone trauma as kids, and every child in the foster care system had a chart rife with it. Stanching the flow of kids into foster care would become a pillar of the foundation’s mission. If Chiang could find a way to do that, he reasoned, they might be able to curb untold societal costs to come. 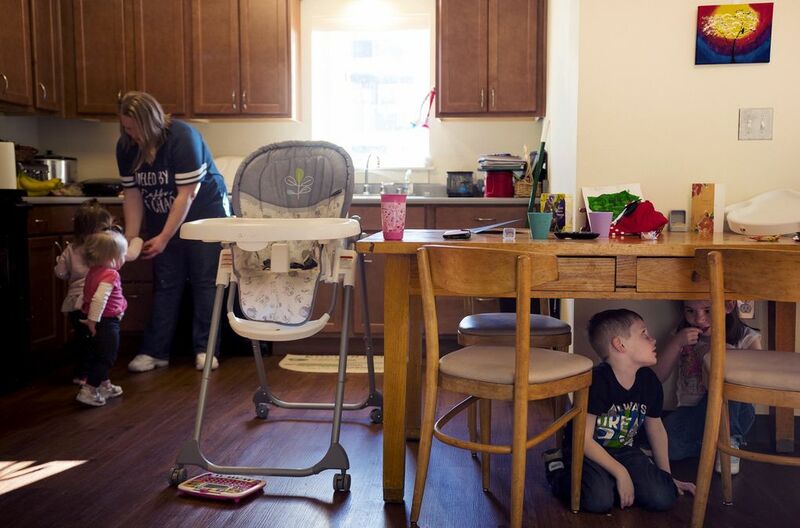 Homelessness, addiction, poor education and revolving-door contact with the courts — all are common for children who have spent time in foster care. 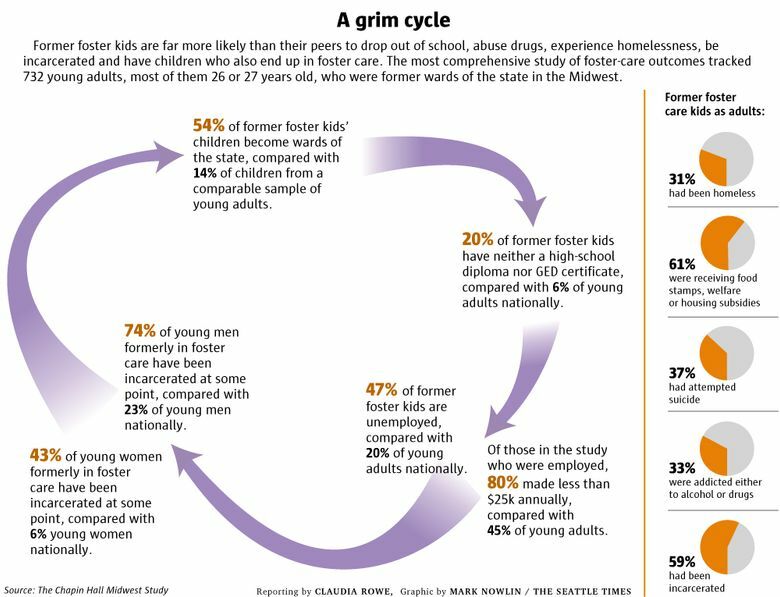 A third of the young adults now living on the streets in Seattle are former foster kids, as are up to 70 percent of inmates at juvenile detention centers and adult prisons nationally. Foster children are five times more likely than others to abuse drugs, according to federal research, and they drop out of school at rates higher than any other group of students — mostly due to the trauma of being taken from their families and the neglect that precipitated the removal to begin with. At least one expert likens the experience to chemotherapy — necessary in a crisis, but toxic. “It turns out that our child welfare system is a kind of patient zero for the crises overwhelming our other social service organizations,” said Sherry Lachman, a former foster child, attorney with the Juvenile Law Center and founder of the advocacy organization Foster America. National data show that at least 36 percent of children entering foster care have a parent struggling with addiction, Lachman said, but many child welfare leaders believe the number is much higher. Either way, the opioid crisis has supercharged this trend. In Washington, the rate of babies born addicted spiked more than sevenfold between 2000 and 2014. 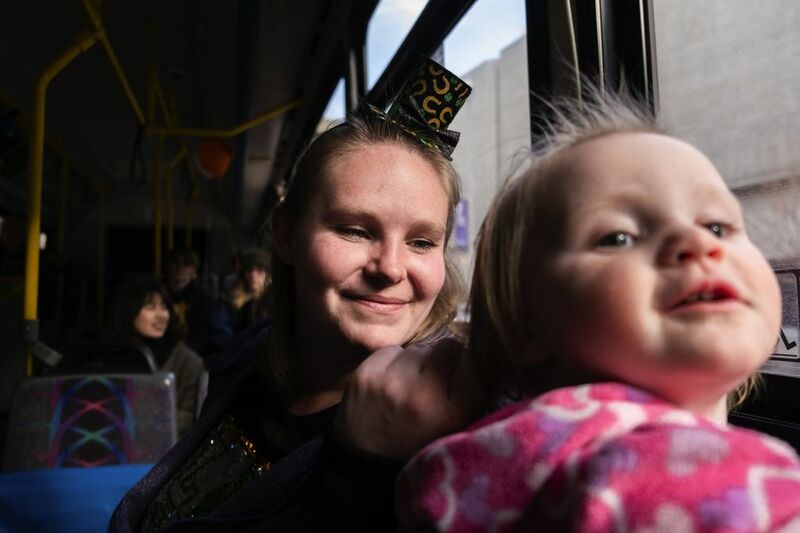 Five hundred miles away in Medford, Ore., the OnTrack program for addicted moms and dads provided the model Chiang sought — reuniting children with their parents while teaching the entire family to grow together. This was 180 degrees from the standard approach, which puts addicted parents into detox for 90 days, sends their children to live with strangers and offers vague assurances that someday, maybe, they’ll be together again. OnTrack flipped this model, housing all family members and treating their addictions, parenting deficits and emotional problems simultaneously. 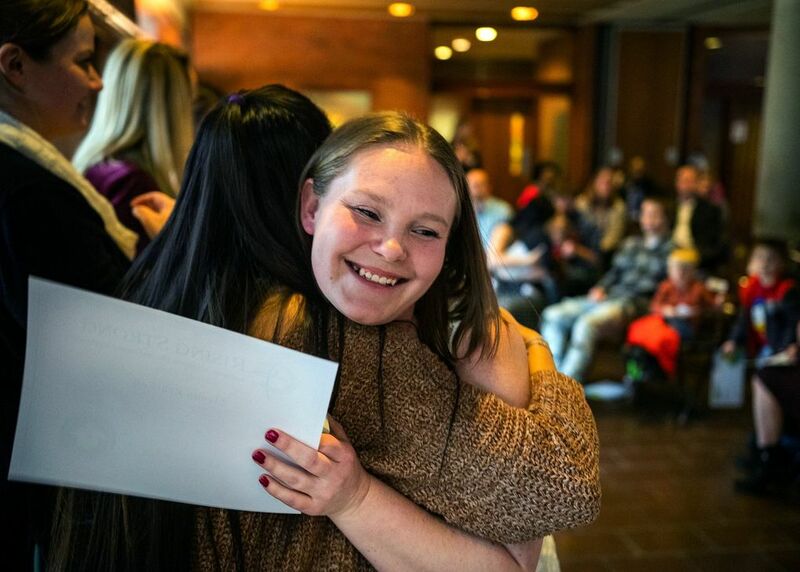 Between 2005 and 2010, Oregon child welfare officials credited the program with helping 155 families reunite, significantly cutting the number of Jackson County kids in foster care. Bracken was only dimly aware of these trends when she landed at Rising Strong, a pilot version of the Oregon program, in the fall of 2017. 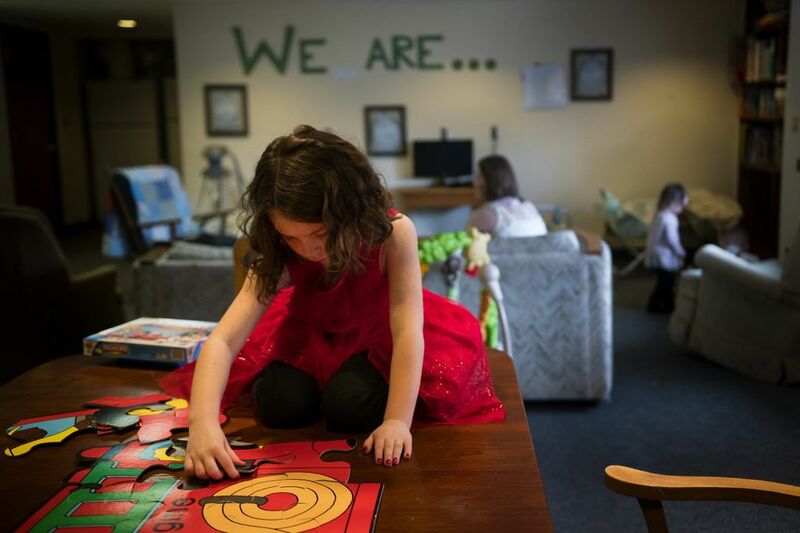 With the help of Catholic Charities of Spokane, Chiang’s foundation had purchased a former convent, turned its upper floors into a series of spare, dorm-style rooms and created common areas where Rising Strong’s 14 inaugural families could cook communally, talk or watch their children play. Bracken was one of the very first residents. Only a year before, she’d watched as police officers arrived — for the fourth time — to announce they were taking her youngest child away. By then, Bracken felt neither panic nor rage. Only resignation. “Maybe I’m just not a good-enough person,” she thought, as a social worker rattled off the familiar litany of rights she was losing. For the next six months, addicted and pregnant again, Bracken lived in a Jeep parked by the side of the road. Eventually, she moved into a homeless shelter, where a caseworker referred her to Rising Strong. Now here she was, in a convent with a baby. She walked the dim carpeted hallways, feeling almost entirely alone. Within a few weeks, Bracken got her toddler daughter back. The 1-year-old took her first steps and learned her first words at Rising Strong. 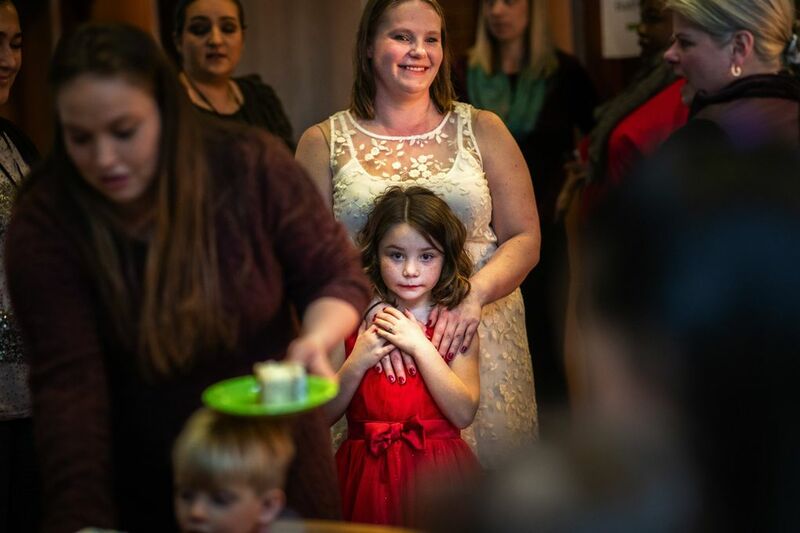 Soon after, her older sister and brother were brought over from foster care, learning to read and play with other children in an off-site preschool while Bracken spent her days going from one therapy session to the next: counseling to deal with her own early trauma and group sessions to learn parenting. Now she had all the children back except her eldest, a 14-year-old girl whom a judge had permanently removed from Bracken in the early days of her addiction. 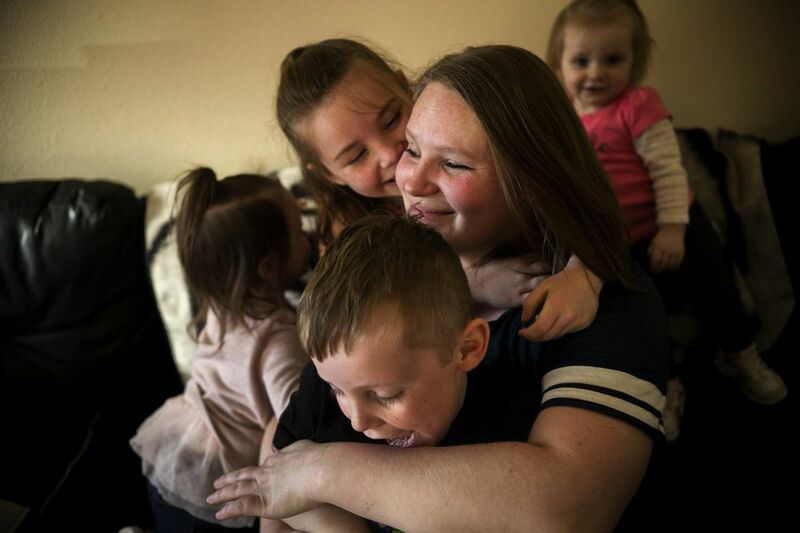 For Bracken, the toughest hurdle — other than tolerating nightly bed checks, random drug tests and other people’s dirty dishes — was learning to hug her children and allowing them to hug her back, a lesson she’d missed during her own tumultuous childhood. All that treatment and child care is expensive — on average, about $60,000 per family. Empire Health, which was formed in 2008 through the sale of a nonprofit hospital system in Spokane, spent $5.5 million in public and private funds to get the program running for its first three years, including the purchase of the convent. But Chiang believes the outlay could save millions of dollars in future incarceration and homelessness costs. 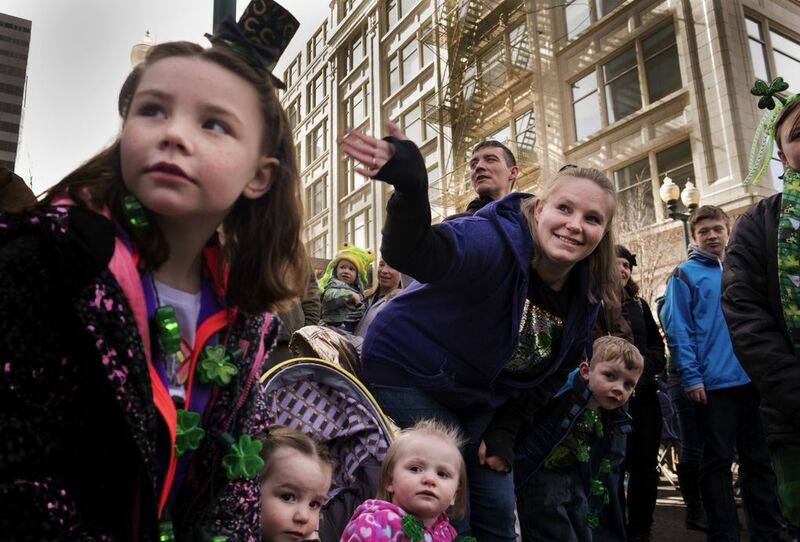 A 2013 study of 1,029 families in Washington appears to bear that out. It found that successfully reuniting foster care children with their biological parents saved the state more than $21,000 per child each year. 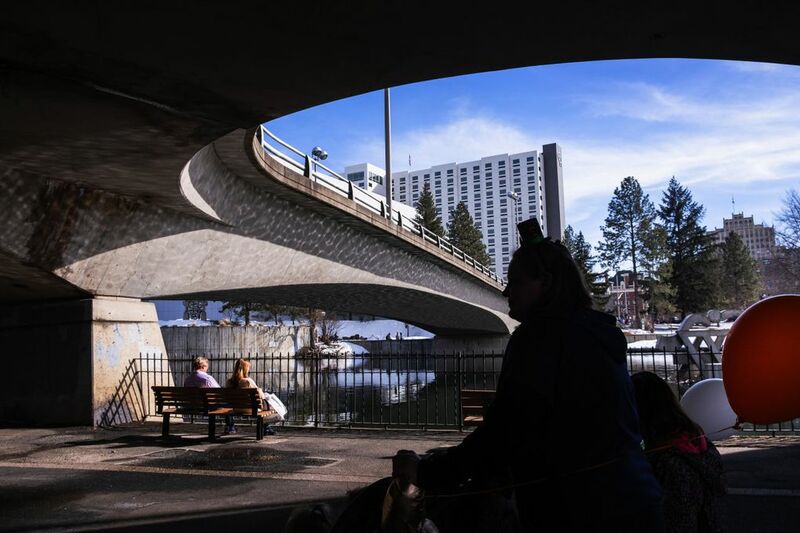 That could be significant in Spokane County, which sends about 50 kids into foster care every month — the second-highest rate in the state after Pierce County — and the vast majority of those removals are due to parents’ addiction, said Spokane Family Court Commissioner Michelle Ressa. By May, Rising Strong expects to have 30 families on site. By 2022, program leaders plan to serve 50 families a year. But the particular circumstances that led to Rising Strong’s creation — a local philanthropy targeting foster care and having access to a serene, vacant space — could limit the spread of this unusual approach. Frank Ordway, director of government affairs for the state Department of Children, Youth and Families, endorsed it as “absolutely leading edge” for a system that — despite its nominal support for families — offers little to help them remain intact. “It’s baffling that the idea of keeping families together is so revolutionary, yet such common sense,” he said. Ressa, the family court commissioner, believes it’s essential. Otherwise, most of the children coming through her courtroom have no option other than foster care — especially if they are being raised by single dads. Normally, when Ressa faces a father struggling simultaneously with addiction and child-rearing, she must send the kids away; no place other than Rising Strong will take men who are parenting. Same thing when a mom has teenagers, since most residential treatment does not allow older children on site. The inclusive approach did cause some unforeseen difficulties during Rising Strong’s first year — such as couples taking baths together, and at least one unintended pregnancy. Though almost all adult residents use Suboxone or other anti-addiction medications, two parents were unable to graduate because they refused to take a drug test a week before the final ceremony. But last January, half of the first cohort of 14 families had made it through. At a party celebrating that achievement, 17 children who’d once lived with strangers were playing hide-and-seek behind their parents’ legs. Bracken’s 6-year-old daughter, wearing a red lace dress, danced with a first-grade boy whose parents were toasting each other too (with diet soda). The event felt more like a child’s birthday party than a graduation from an opioid-treatment program. “Do it mom! Do it!” squealed one of the kids as his mother rose to accept her certificate. 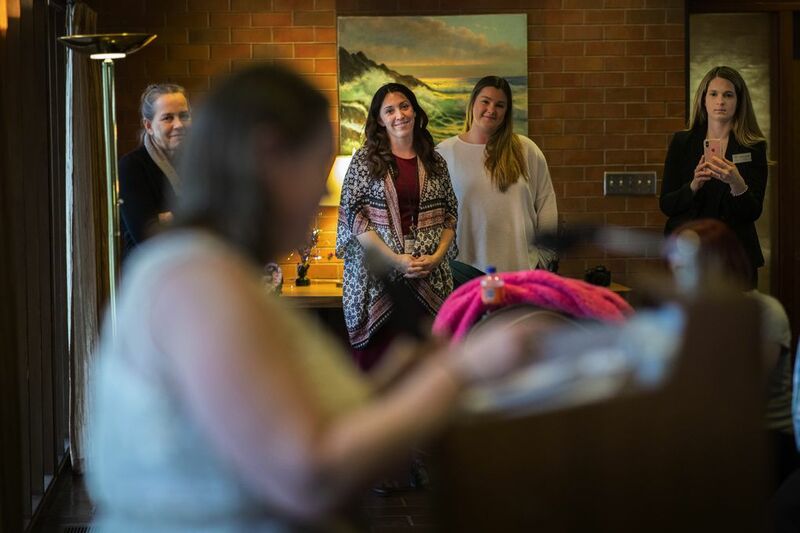 Shannon Boniface, regional supervisor for the Department of Children, Youth and Families, acknowledged some early misgivings about the whole-family model. But she is sold on it now. The day they were discharged from Rising Strong, Bracken and her children opened the door to their new home, bracing for disappointment. The apartment they’d been assigned by the program and watched for months under construction would be too small, Bracken feared. She had her Section 8 voucher and food stamps, but no table, chairs or dishes. After years of failure, she was preparing for yet another round of defeat. 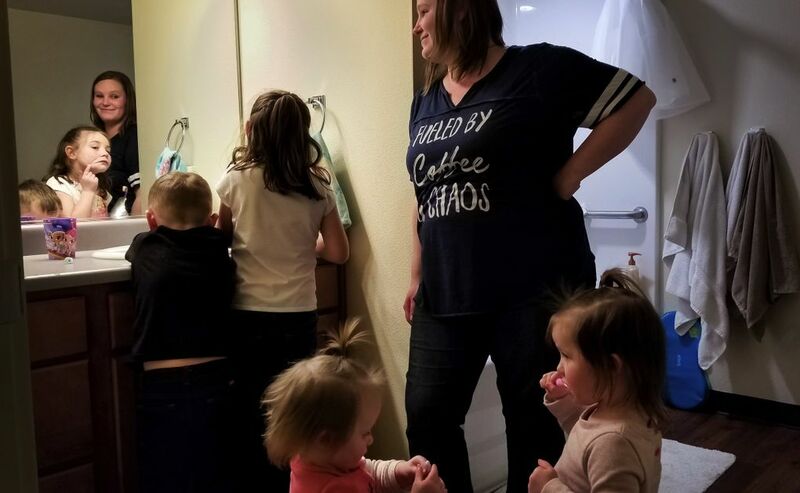 Her children, however, pushed right inside. “Our own house! Our own house!” they sang, dancing from room to room. The next day, Rising Strong staffers would bring Bracken an old dining table. Later, someone found her a new couch. Once a week for the next few months, she’d visit the convent for additional counseling. By springtime, Bracken was preparing to test for her GED certificate. But that first night, Bracken made a Tater Tots casserole and sat on the floor with her kids, happy to be eating in a home where they could close the door and live as a family. Clarification: an earlier version of this story overstated the number of children placed in foster care as a result of their parents’ addictions, though experts say many children taken into care for “neglect” see addiction at home as well.